The death toll from the incident could possibly go up, said Clark County Coroner John Fudenberg in a press conference Monday afternoon. Jason Aldean was the headliner of Sunday night's concert; video showed him rushing off the stage amid the gunfire. Other performers from this weekend included country stars Jake Owen, Big & Rich, Luke Combs and Dylan Scott. 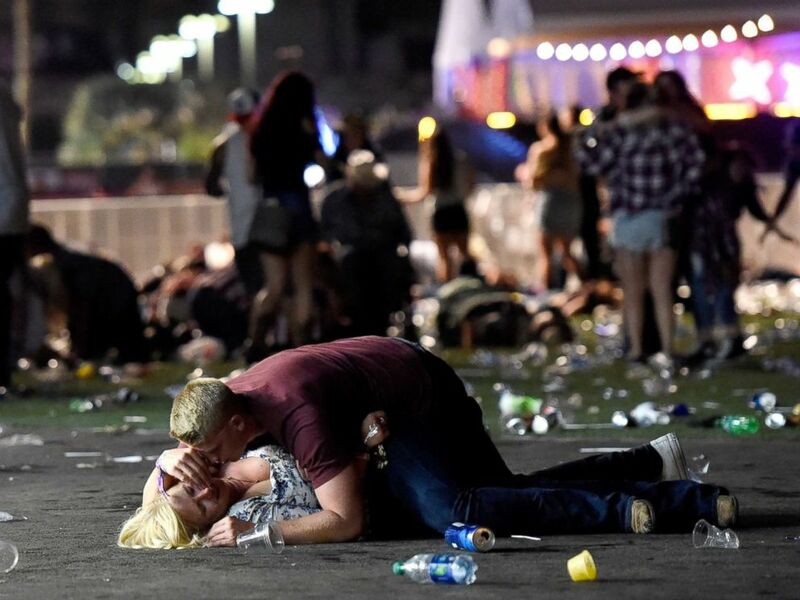 The shooter, perched on the 32nd floor of the Mandalay Bay hotel, sent more than 22,000 country music fans scrambling for their lives. One witness described the shooting as "non-stop gunfire." Terrified bystanders ducked and ran, while some sprang into action, frantically caring for the wounded. 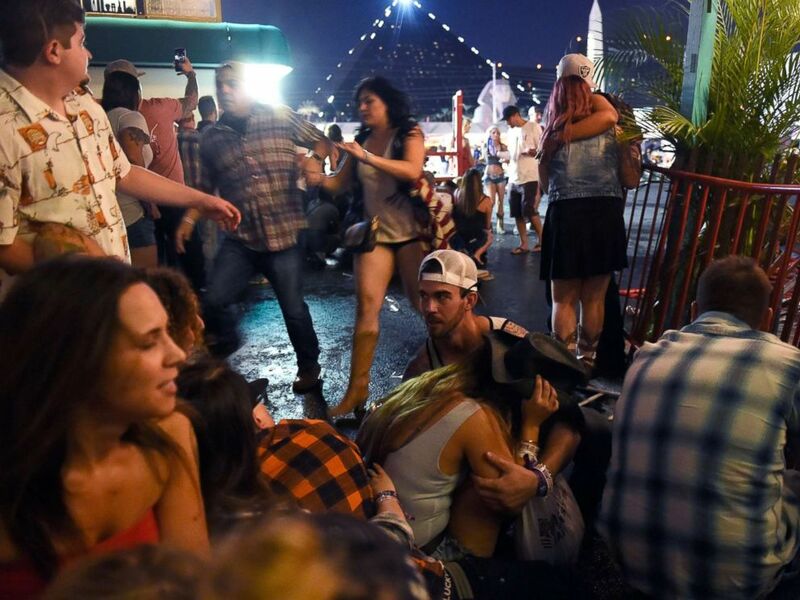 Concertgoers who had just been enjoying the final night of the Route 91 Harvest Music Festival, which was taking place across the street from Mandalay Bay, made makeshift stretchers out of police barricades. 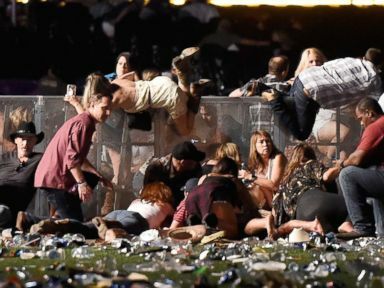 An official with Las Vegas’ McCarran International Airport said "an airport perimeter fence near the concert venue was breached by people fleeing the scene of the incident," and airport staff "transported those people to the designated evacuation site." A spokesperson for Allegiant Air said about 30 people who fled onto the airfield were sheltered overnight at one of the airline's facilities there. The airline said its staff helped people get clothes, charge their phones and contact loved ones. A man lays on top of a woman as others flee the Route 91 Harvest country music festival grounds after an active shooter was reported on Oct. 1, 2017 in Las Vegas. The woman later was seen getting up with help. As ambulances rushed to the scene, first responders plugged wounds with their bare hands and used their clothing to try to stanch each other's bleeding. At least one man described a stranger who died in his arms. 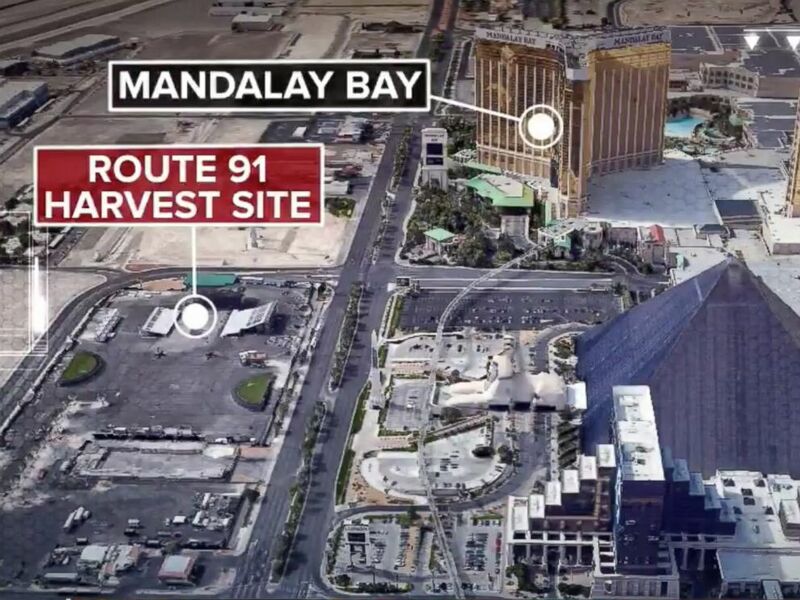 Authorities said the suspected gunman -- 64-year-old Mesquite, Nevada resident Stephen Paddock -- checked into the Mandalay Bay hotel Thursday and brought the numerous firearms found in his room himself. At least one gun dealer came forward to authorities to say that he sold weapons to Paddock, Lombardo said. Chris Michel, owner of Dixie Gunworx in St. George, Utah, told ABC News that Paddock came into his store three times -- always by himself. The first two times Paddock didn't buy anything, but the third time, he bought a shotgun. It is unclear is Michel is the gun dealer referenced by police. Michel said Paddock seemed like "an average, everyday" guy and that his purchase was "legal in every way." He added that he does not know if the gun he told to him was used in the massacre. Eric Paddock, the suspected shooter’s brother, told ABC News, "We have no idea how or why this happened." 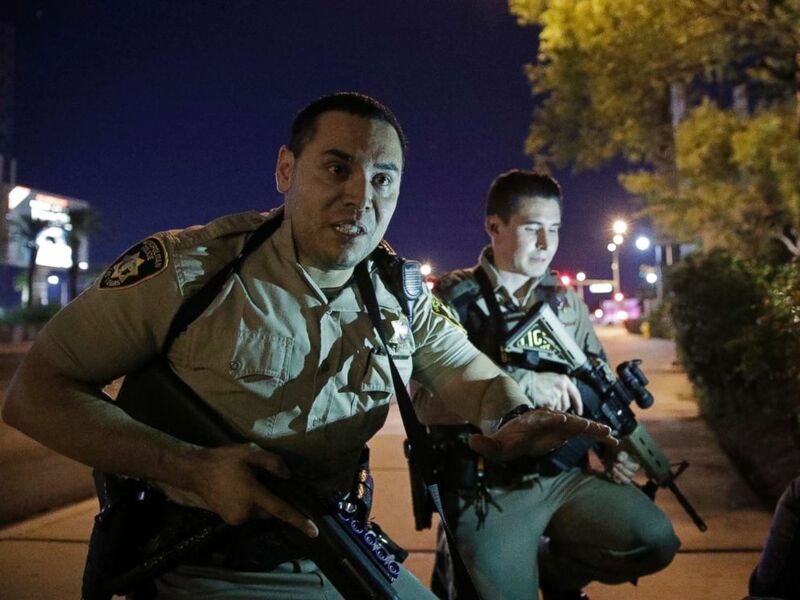 Authorities initially said they were looking to speak with a companion of the shooter, Marilou Danley, whom Lombardo said he believes to be Paddock's girlfriend. While Danley is out of the country, police said Monday morning that "detectives have made contact with her and do not believe she is involved with the shooting." However, authorities will continue their investigation into Danley, Lombardo said. Police said she is out of the country and it's believed the suspect was using some of her identification. "I can't get into the mind of a psychopath," Lombardo said at a news conference this morning. PHOTO:Las Vegas strip shooting after a gunman opens fire near Mandalay Bay casino, Oct 1, 2017. 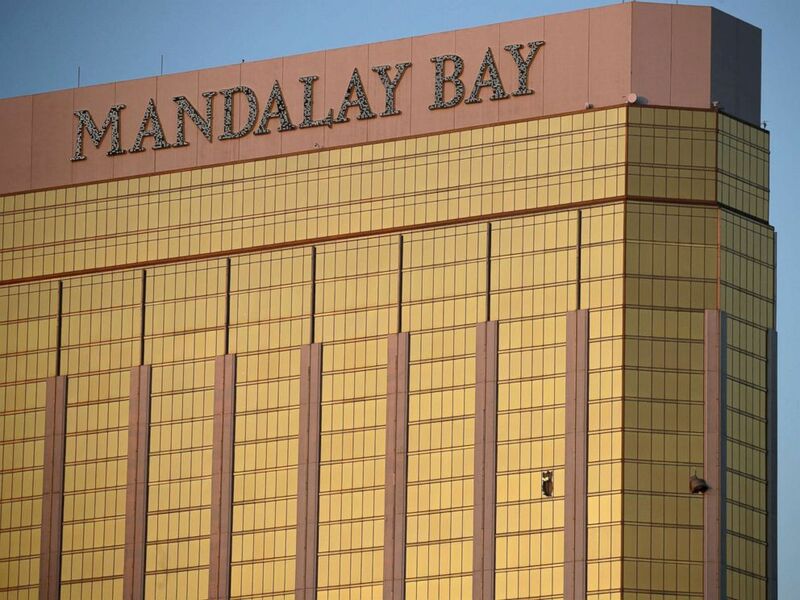 Mark Mullen -- who was staying on the 29th floor of the Mandalay Bay hotel -- told ABC News that when the shots broke out, he was sitting in his room and listening to the concert while doing prep work for a conference scheduled for Monday. Mullen said he thought the noise was fireworks at first, but when he looked out the window, he couldn't see anything. "The noise continued, but there were no fireworks, and it quickly became apparent what was happening," he said. People in the crowd hunkered down as the shots rang out, and begin running again when they stopped, Mullen said. The crowd would then stop again as the gunshots resumed, he said. From his vantage point, it wasn't clear where the shots were coming from, Mullen said. But his colleagues who were staying on the 32nd floor texted him when they heard the SWAT team arrive, so he knew that something was going on at the hotel, he said. Mullen said he could see sheriff's officers walking through the hall with guns drawn through the peephole in his hotel room door. He could also see a police helicopter flying very close to the hotel and shining a light near the shooter's room, he said. 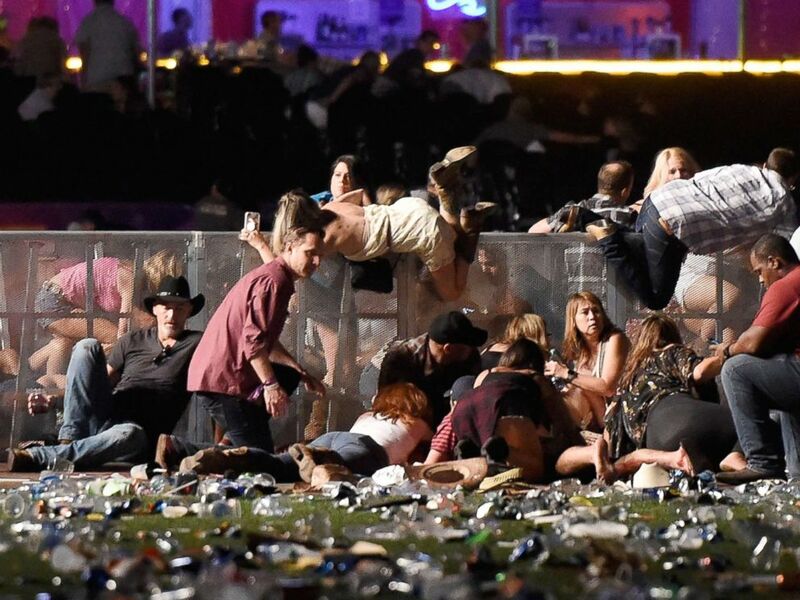 Witness Brian Claypool, who was sitting in a VIP area near the near the stage, said on "Good Morning America" on Monday that after the first round of gunfire, he ran into a little room that he described as a production area. "The hardest for me was, I saw six young women. They were maybe 20, 22. They were all crying on the ground. I was trying to be calm," Claypool said, appearing emotional. "I thought [about] the Orlando shooting," he said of the 2016 Pulse nightclub shooting that left 49 people dead. "Because we were in this room. 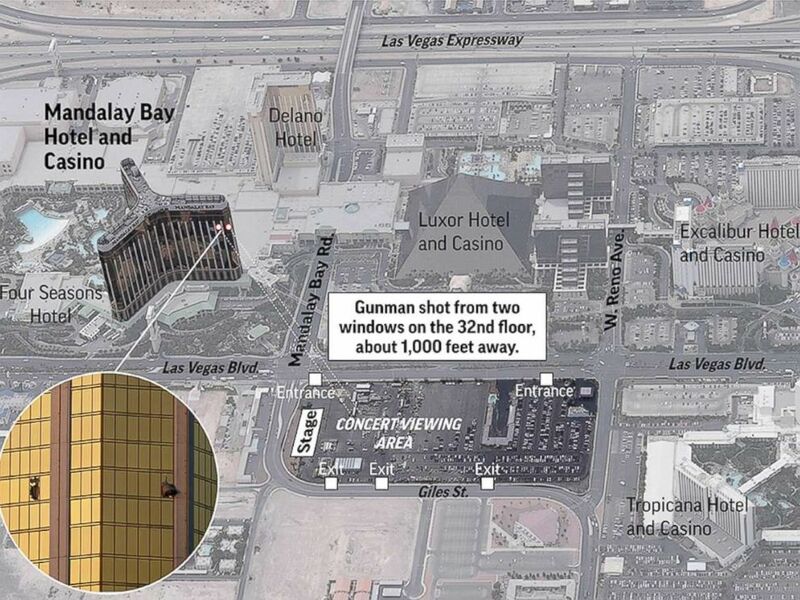 We didn’t know where the shooter was. We thought he was going to jump the fence and come in this room and shoot us all... I’m thinking, 'Am I going to die in this room?'" "I said to myself, 'These girls aren’t going to die. I’m not going to die,'” he said. “'I need to get home to see my daughter. 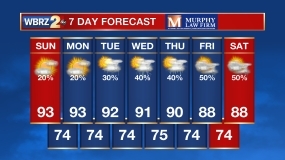 This is not happening.'" "Then the shooting stopped," Claypool said, "And I peeked out the front of the door ... police officers scream, ‘Go! 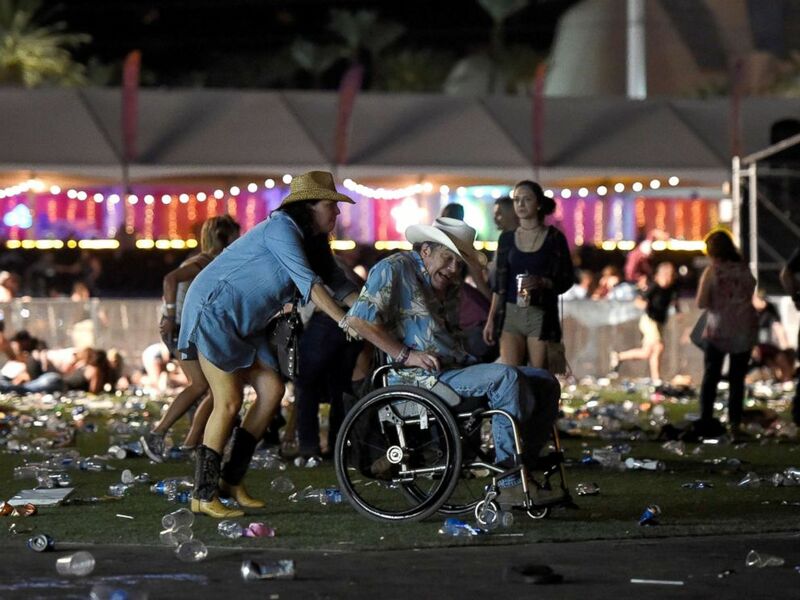 Go!’"
A man in a wheelchair is taken away from the Route 91 Harvest country music festival after gun fire was heard, Oct. 1, 2017 in Las Vegas. 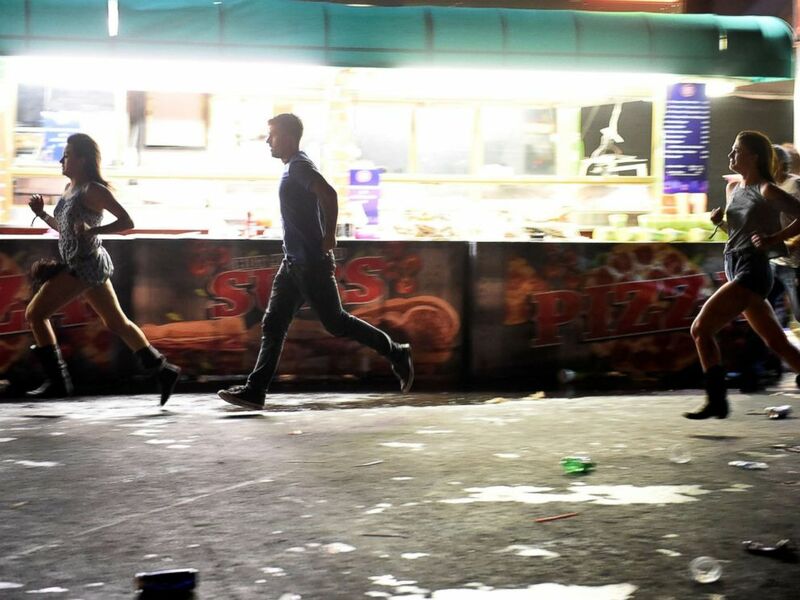 People run from the Route 91 Harvest country music festival after gun fire was heard, Oct. 1, 2017 in Las Vegas. Concertgoer Mike Cronk told ABC News that as Aldean was playing, it "kind of sounded like some fireworks going off. I think there was the first kind of volley, and then all of the sudden second volley. My buddy's like, 'I just got hit, you know.' He got hit three times. Then people started diving for the ground. "It was pretty much chaotic," Cronk continued. "Lots of people got hit." Cronk said EMTs and ex-military members hunkered down to help his friend and other victims survive. Cronk said he started to staunch his friend's bullet wounds under the direction of a woman who was with them. Stabilizing his friend as best he could, Cronk said he and four other people tending to the wounded attempted to get to a hospital by hopping into the bed of a pickup truck. Cronk was beside himself with emotion as he described helping a badly injured man into an ambulance. The man ended up dying in Cronk's arms. People run for cover at the Route 91 Harvest country music festival after gun fire was heard, Oct. 1, 2017 in Las Vegas. Jasmine Barbusca, a mother of two, told ABC News, "All you heard were just gunshots. And every time the gunshots would come down, you just start getting to the ground. And when they would stop, you get up and you just try to climb the fence again. We finally made it over. We were running through the parking lot; everybody just ran through the streets." She said she was thinking, "'I got to get out, I’m going to be dead in five seconds.'" "There were men going over their wives, their girlfriends, to block them," she recalled. "Unfortunately, those men got shot, but I mean, there were lives saved." "I don’t know who the man was, but there was a man who probably saved a good 20 women’s lives. He was really brave," she said. Tearing up, she said, "How I did not get shot... by the grace of God. I honestly... we ran. I don’t know." 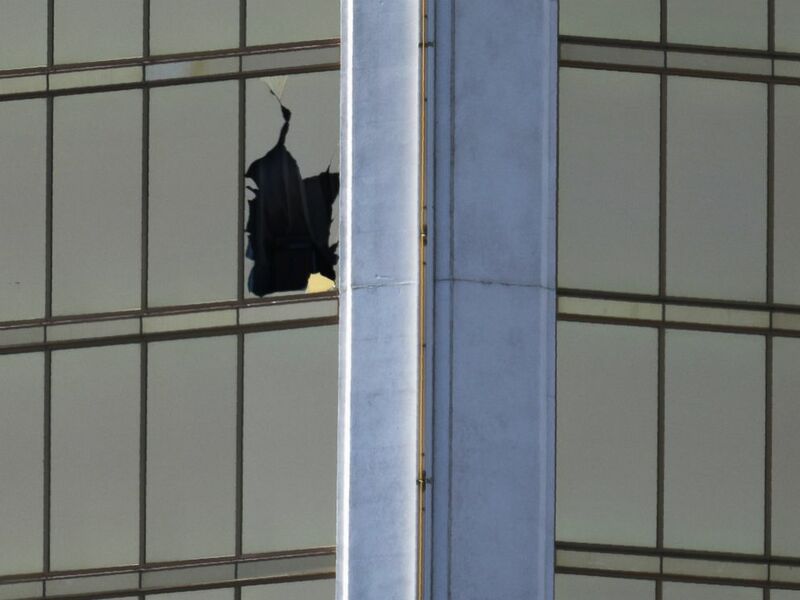 By Monday afternoon, investigators had finished processing the hotel room at Mandalay Bay, the location of the music festival and Paddock's home in Mesquite, and SWAT officers were standing by another house in northern Nevada, Lombardo said. Authorities found 19 additional firearms, explosive and some 1,000 rounds of ammunition at the Mesquite home, Lombardo said. Police confirmed this evening that that they found several pounds of ammonium nitrate -- a material used to make explosives -- inside the suspect’s car. Agents for the U.S. Bureau of Alcohol, Tobacco, Firearms and Explosives have responded to the scene and the FBI is assisting with the investigation. ATF said it is "conducting an urgent trace" on the recovered weapons. Fasulo refuted rumors of a second shooter, saying there is "no information or evidence" to suggest that more than one shooter was involved. There is no ongoing threat to the Las Vegas area, he added. Officials praised first responders, doctors and community members in the wake of the mass shooting. Congresswoman Dina Titus, who represents the 1st district of Nevada, which includes Las Vegas, citing acts of heroism by community members and off-duty police officers during the attack and medical personnel caring for people in the parking lots of the overcrowded hospitals. Titus added that a friend of one of staff members was trampled, and a stranger pulled her up and took her to safety. "Las Vegas is resilient," Titus said. "With everybody pulling together, we will get through this." Lombardo said he was "very proud" of what the officers on the scene did, saying that while they train for active shooter situations, "this is different than anything you train for because the active shooter is unreachable." A total of 108 firefighters from four different fire departments were on the scene, as well as several ambulances from private companies, Cassell said. People on the scene "rallied everything they could" to get the injured to the staging area, including vans and pickup trucks, Cassell said. So many people have donated blood that officials informed the public not to go to the donation centers until at least Tuesday afternoon, saying that they have "enough supply for the foreseeable future." Mandalay Bay Resort also thanked area first responders, tweeting, "Our thoughts & prayers are with the victims of last night's tragic events. We’re grateful for the immediate actions of our first responders." Officials set up a family assistance center at the Las Vegas Convention Center, where family members can provide information about the identities of loved ones so authorities can identify the victims "as fast as possible," Fudenberg said. The center is the best way for locals to get assistance, Fasulo said. Police said family and friends looking for their loved ones can call 1-800-536-9488. Area hotels, including MGM Resorts International, are coordinating rooms at no cost for families coming into town, and the American Red Cross established headquarters at the Circus Circus Hotel & Resort, Fasulo said. A GoFundMe account started by Lombardo and Clark County Commissioner Steve Sisolak to help victims and their families pay for funeral and travel expenses received nearly $2.4 million in donations by Monday evening. One donor alone pledged $400,000, Sisolak said. Multiple vigils will be held in the Las Vegas Monday afternoon. President Donald Trump addressed the public this morning, calling the shooting "an act of pure evil." Trump said he will visit Las Vegas Wednesday to meet with law enforcement, first responders and victims' families. "In moments of tragedy and horror, America comes together as one," Trump said. He added, "In memory of the fallen, I have directed that our great flag be flown at half staff." U.S. Attorney General Jeff Sessions said in a statement, "The investigation into the horrific shooting last night in Las Vegas is ongoing." “To the many families whose lives have been changed forever by this heinous act, we offer you our prayers and our promise that we will do everything in our power to get justice for your loved ones," Sessions said. Nevada Gov. Brian Sandoval said at a news conference, "I don't know if I have words to describe what we are going through. ... We are angry, we are grieving, we are confused. People are hurting." "To the people at the concert, you see courage and compassion there," Sandoval said . "People helping total strangers. Risking their own lives to help people. That really speaks highly to the character of America. " Nevada Attorney General Adam Paul Laxalt said at a news conference, "When you see one of these men and women who are wearing a badge, tell them, 'Thank you.' Their selfless actions saved the lives of hundreds of people. Not a dozen, but hundreds of people. This death count would have been many hundred more were it not for [their] brave work." Aldean, who performed at the country concert Sunday night, wrote on Instagram, "Tonight has been beyond horrific. I still dont know what to say but wanted to let everyone know that Me and my Crew are safe. My Thoughts and prayers go out to everyone involved tonight. It hurts my heart that this would happen to anyone who was just coming out to enjoy what should have been a fun night."